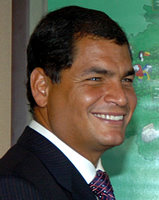 Editor's note: This is the first of a two-part series examining Ecuador under President Rafael Correa. Part I examines Correa's domestic policy. Part II, appearing tomorrow, will examine his foreign policy.